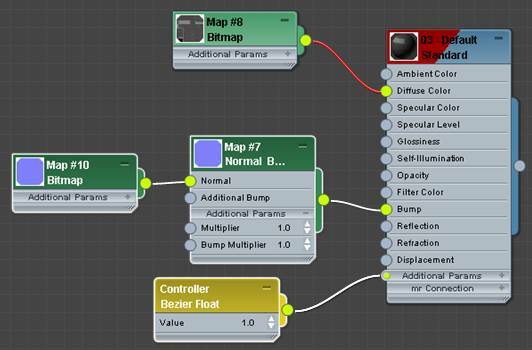 The basics of a Diffuse map is to add a color texture that fits over the Normal Map. 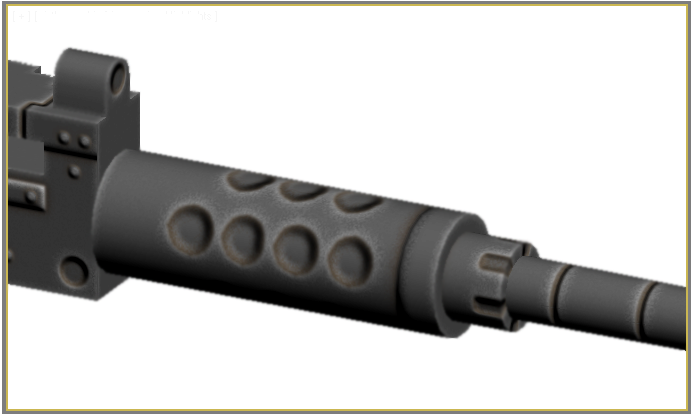 This Diffuse map is created from the Normal map layers by using Layer style effects. The colors should not be too dark, so as not to block the Normal Map shadows on the model. The light colors, should not be so bright, so as not to block the Normal Map highlights on the model. 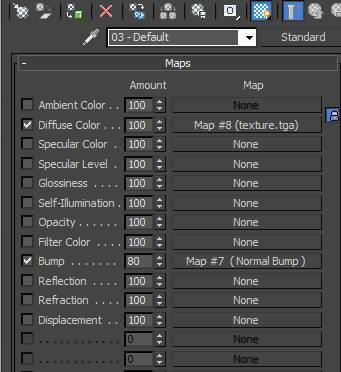 In 3ds Max, you can setup the Diffuse map with nodes, if your version of 3ds Max has the Slate Material Editor. Or you can use the Material slots and Maps roll out. Open the Normal map project from the last tutorial. Add a new layer above the Normal group. Name it ColorBase. Change the foreground color to a dark gray. 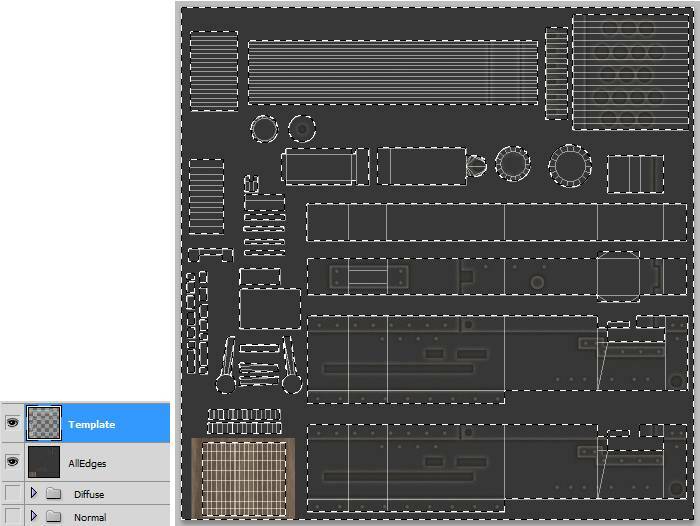 Turn on the Template layer. Go to the ColorBase layer, and fill it with the foreground color. Pick a dark brown color for the foreground, and light brown color for the background. On the ColorBase layer, make a selection over the handle grips mesh. Go to Filter/Render/Fibers. This will fill in a wood texture for the handles. Go to Select/Inverse. 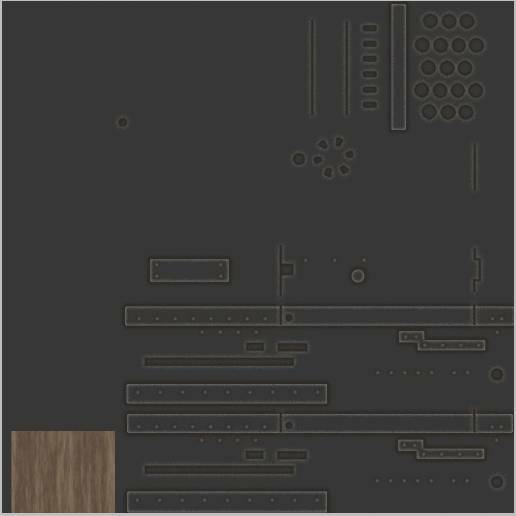 This will select all the other pieces which we want to be gray. Keep the selection on and go to Filter/Noise/Add Noise/0.25%. This will add a bit of texture. 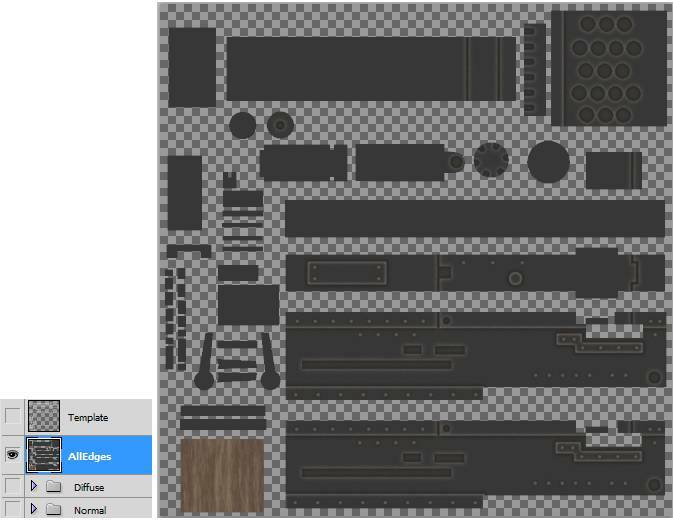 Now check your model in 3ds Max. 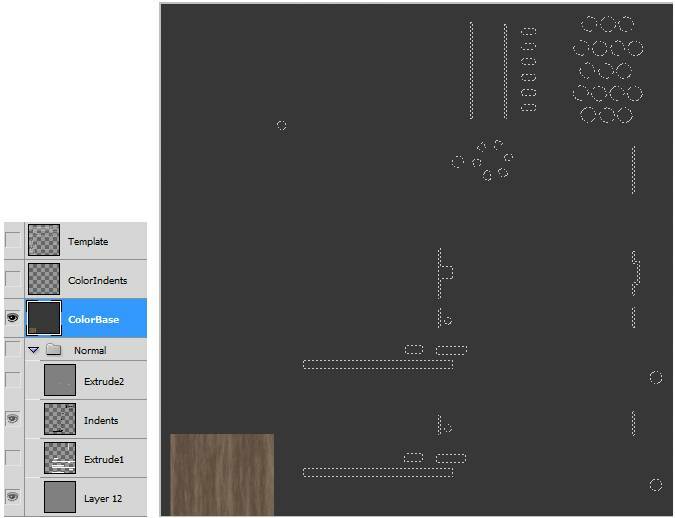 It is still plain looking, but we will fix that with some layer style effects. Add a new layer. Call it ColorIndents. Open the Normal group. Go to the Indents layer in the Normal group. 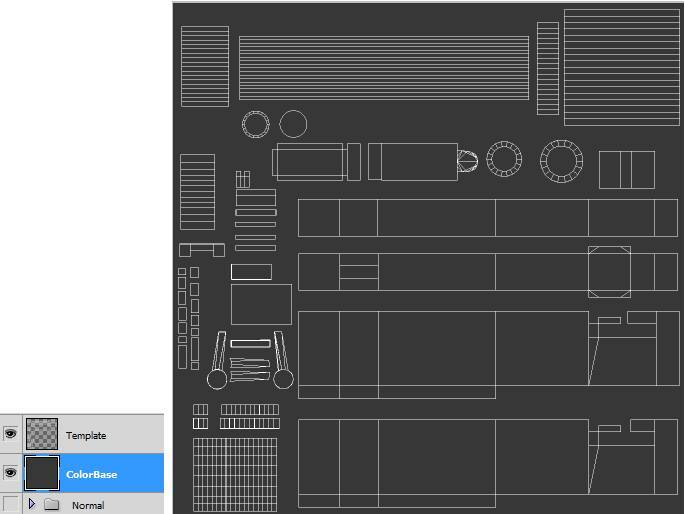 Use the MagicWand tool and click the empty background. Then go to Select/Inverse. The Indents are all selected. 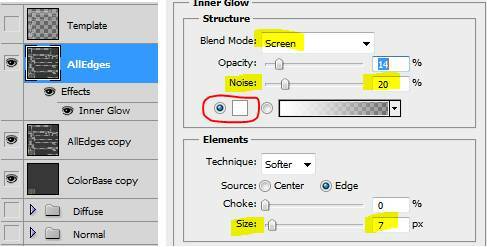 Turn off the Normal group, go to the ColorBase layer and go to menu and Edit/Copy. 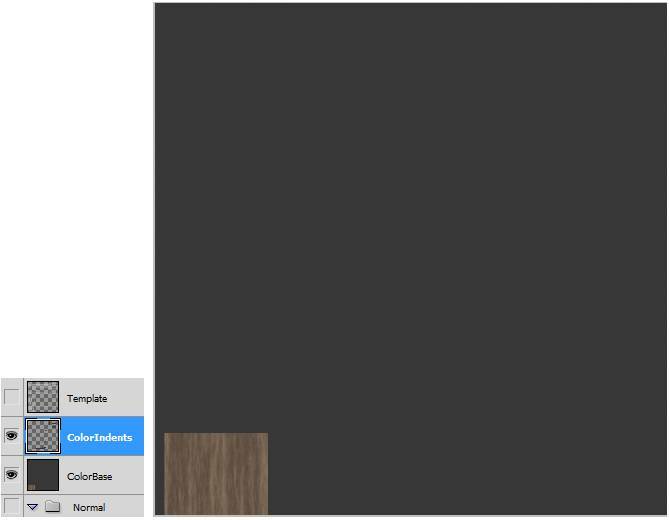 We now have a copy of the ColorBase texture inside the selections. Go to the ColorIndents layer. Then go to Edit/Paste Special/Paste in Place. Merge the pasted layer into the ColorIndents layer. Now we have the ColorIndents layer filled. Turn on the ColorBase layer and the ColorIndents layer. The pieces blend in. We will use Layer Style Effects to the indented areas to add more color to the texture. 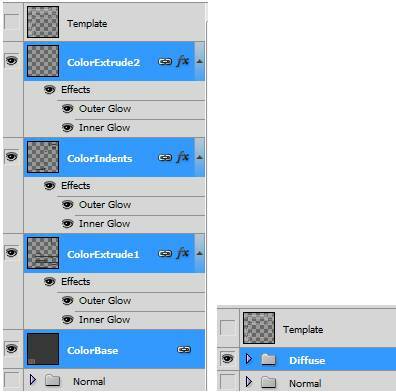 While on the ColorIndents layer, go to Layer/Layer Style/Inner Glow. Pick a brown color to simulate dirt. Blend Mode = Overlay. Size = 10. Noise = 25. Then go to Layer/Layer Style/Outer Glow. Pick a bright grey color to simulate chipped paint. Blend Mode = Overlay. Size = 10. Noise = 20. Finally go to Filter/Blur/Blur More. This will smooth the edges of the indented areas. 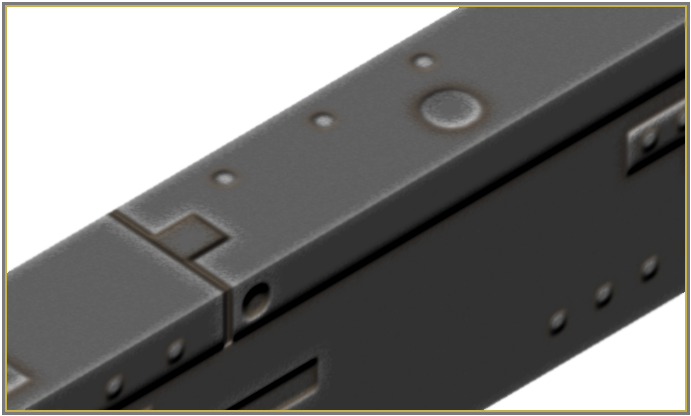 Now we have the texture for all the Indented areas. 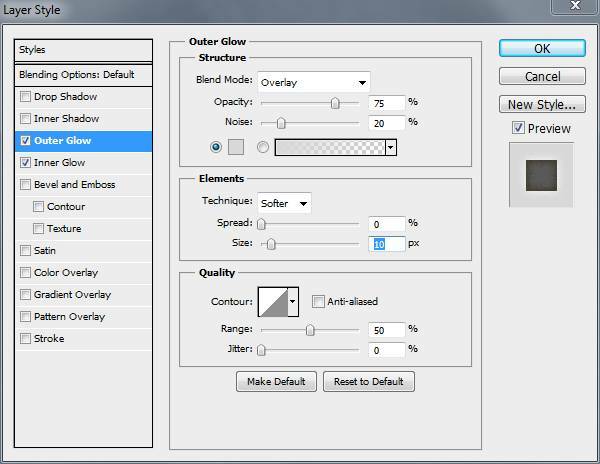 Create two new layers: ColorExtrude1 and ColorExtrude2. #1. 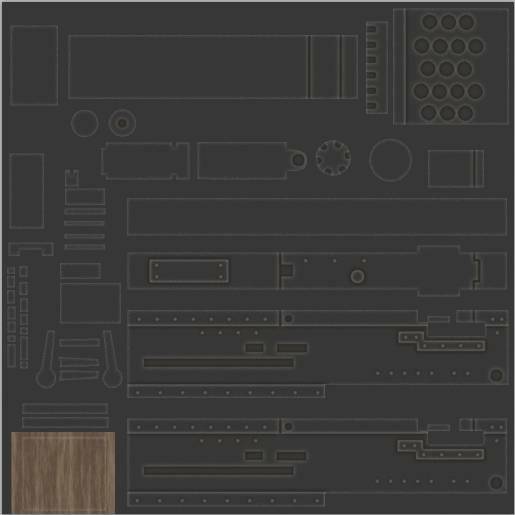 Get the selection of extruded pieces from Extrude1 in the Normal group of layers. #2. 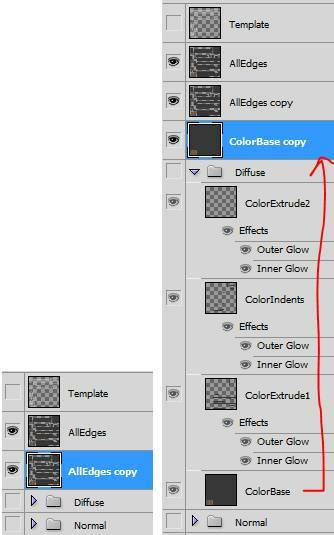 Go to the ColorBase layer and Copy. #3. Go to ColorExtrude1 and Paste in Place. #4. On the ColorExtrude1 layer add an Inner Glow for chipped paint, and an Outer Glow for dirt. #1. Get the selection of extruded pieces from Extrude2 in the Normal group. #3. 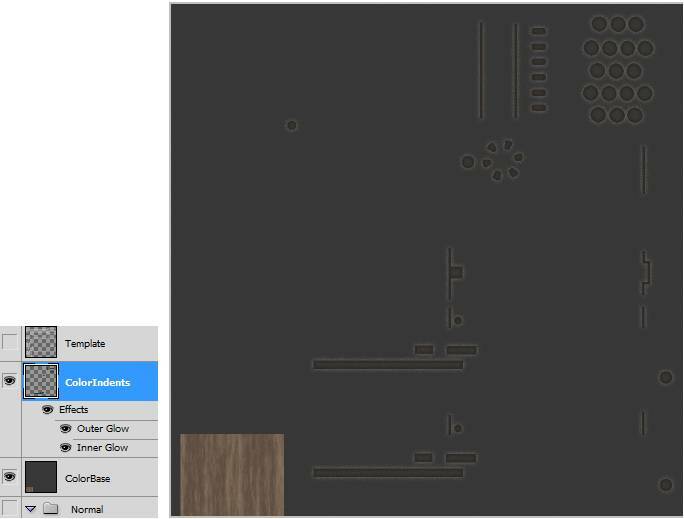 Go to ColorExtrude2 and Paste in Place. #4. On the ColorExtrude2 layer add an Inner Glow for chipped paint, and an Outer Glow for dirt. For the rivets, we want the Inner Glow to come from the Center, Size=5. 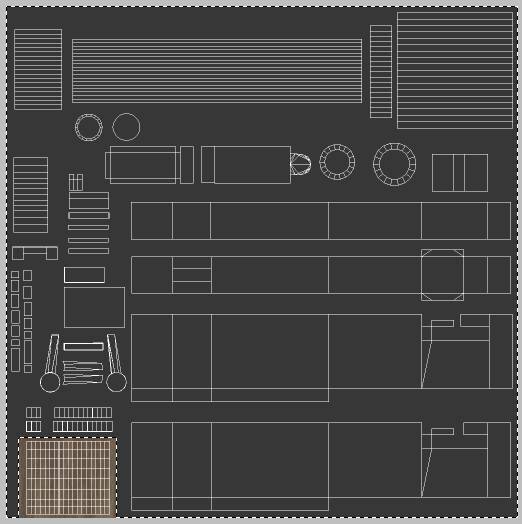 Almost finished the Diffuse(Color) map. 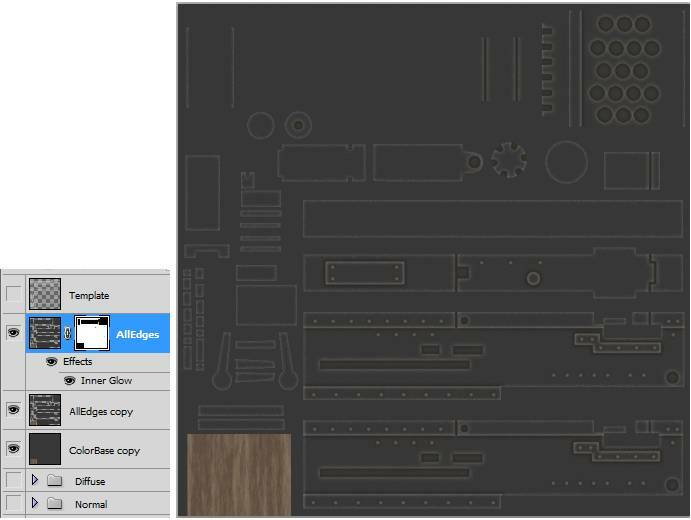 Ctrl-click all the layers below the Template layer and above the Normalgroup. Then right click and go to Link Layers. 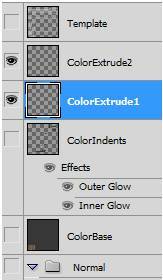 Under Layers on the menu, Group the layers and rename it Diffuse. 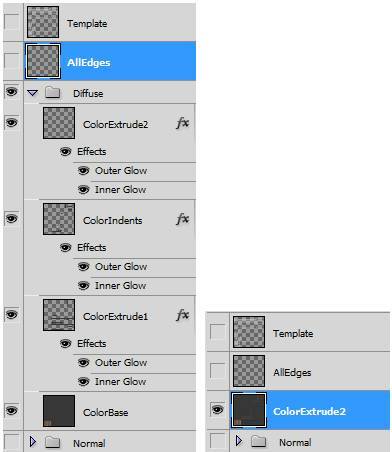 Create a new Layer called Alledges. Put it below the Template layer. 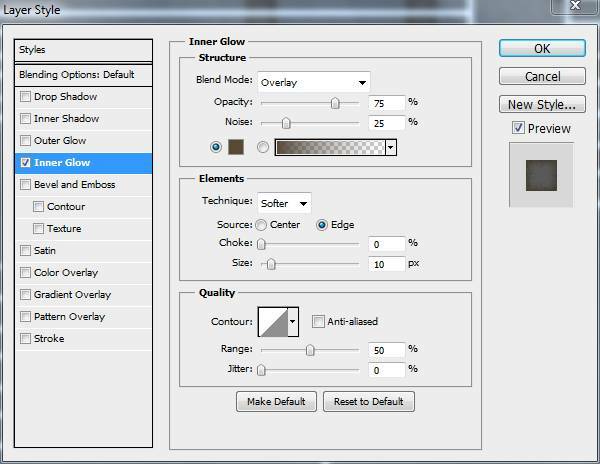 Open the Diffuse group, and turn off all other layers. Merge the Visible layers. Select the entire screen. Go to Copy on the menu. We just want a copy of this diffuse image. Get the Diffuse group of layers back again. We want to keep the Diffuse group if we decide to make any changes there. So, CTRL+ALT+Z until you are back the Diffuse group. 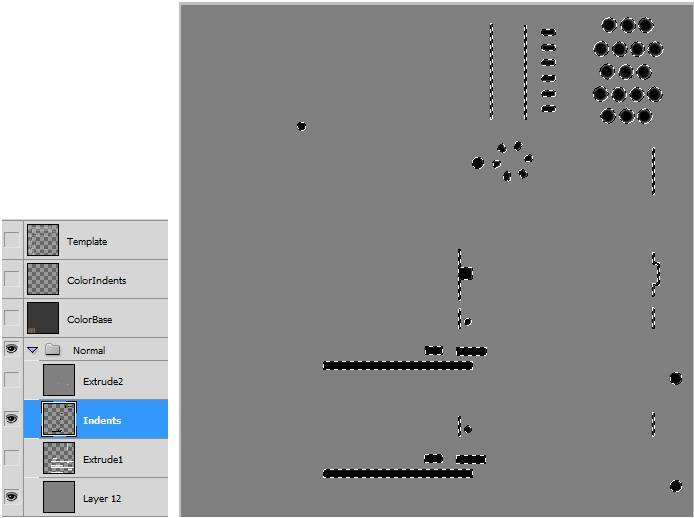 Now go to the AllEdges layer and then Paste from the menu. Now we have a copy of the flattened Diffuse group in the AllEdges Layer. 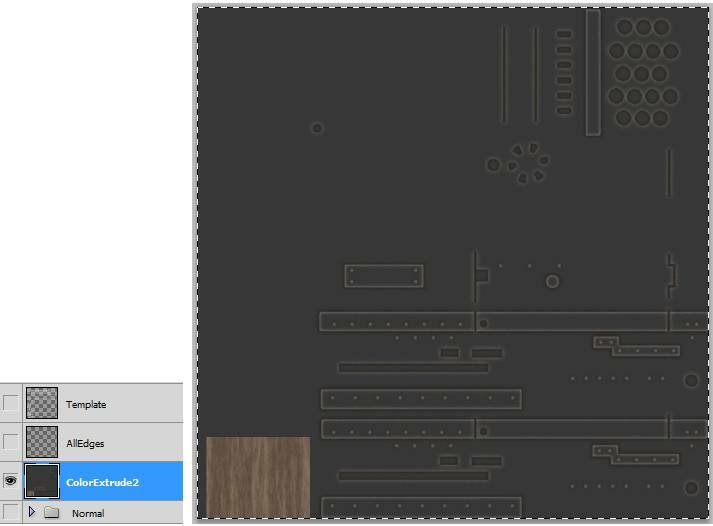 Go to the Template layer and use the Magic Wand tool to click anywhere outside the Template pieces. Go back to the AllEdges layer and press Delete. 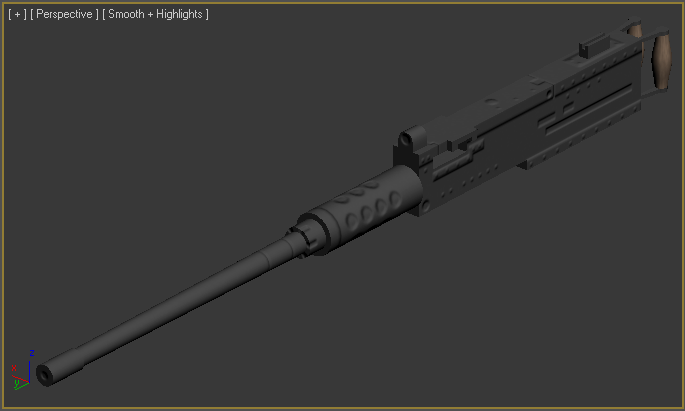 Now we have all the pieces for the gun model. We just have to add a light gray color to all the edges. 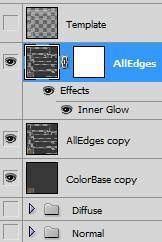 Make a Duplicate copy of the AllEdges layer. 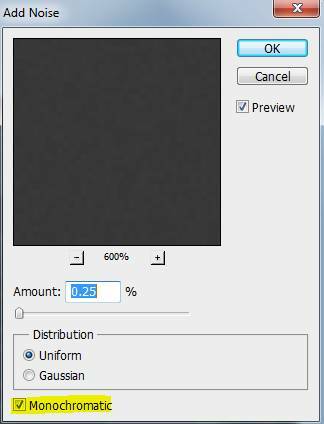 Go to the Diffuse group and make a Duplicate copy of the ColorBase layer and drag it under the AllEdgescopy layer. Go back to the AllEdges layer. On the menu go to Layer/Layer Style/Inner Glow. White color, Noise=20, Size=7. All the pieces have a light gray edge. 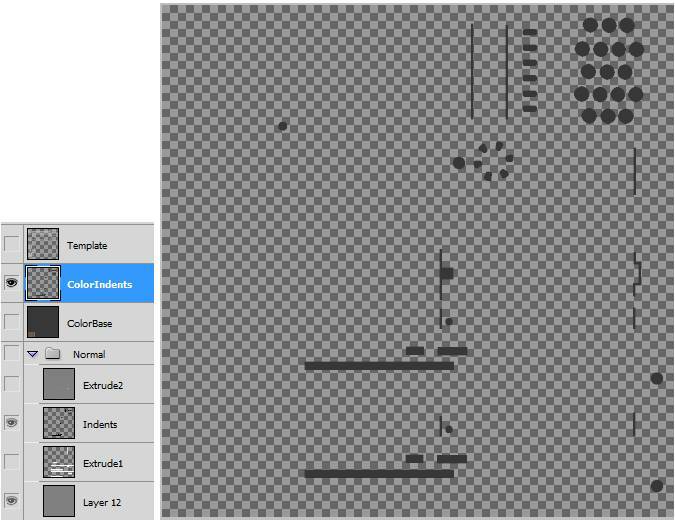 Add a layer mask to the AllEdges layer. Go to Layer/Layer Mask/ Reveal All. Now use the Pencil tool. Size=25. Make the foregroundcolor black. 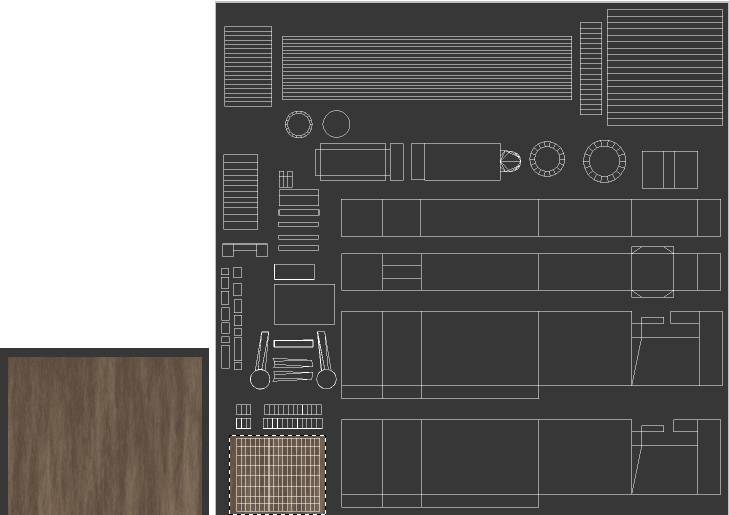 On the AllEdges layer, click the layer mask, then use the pencil to erase edges we don’t want to show on the model. 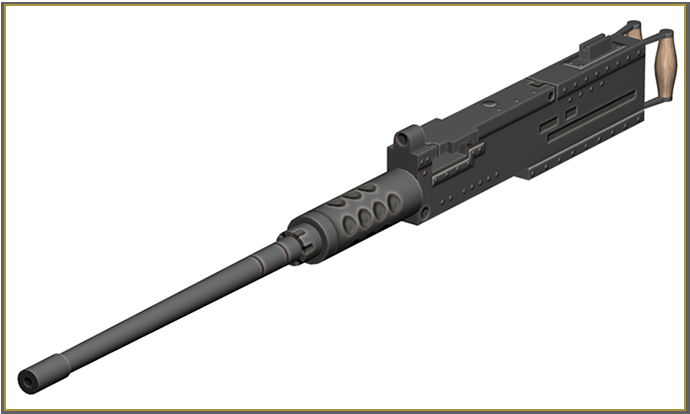 The edges to erase are mostly on the barrel pieces, and the line indent areas on the gun box. This is the Final Diffuse image. 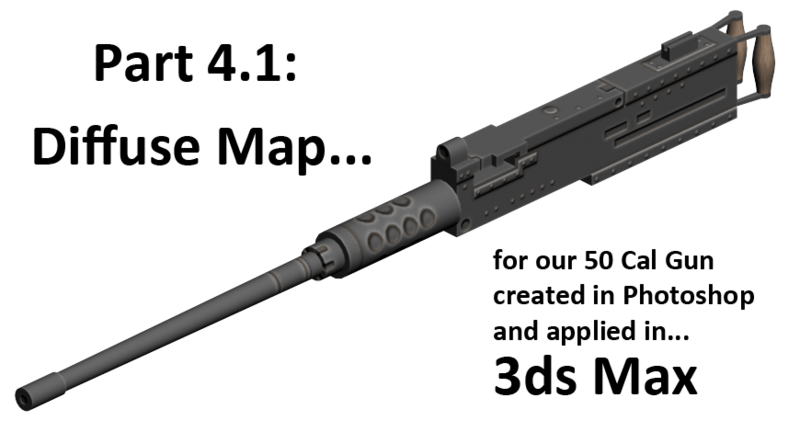 Now check your model in 3ds Max. We will apply a Specular map to the model. This will give a shiny reflection on all the outer edges to give a realistic chipped paint effect.